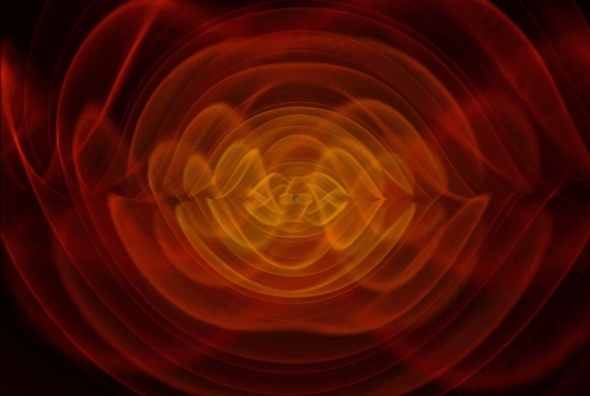 A simulated view of gravitational waves rippling out from merging black holes. The reddish waves correspond to those recently detected from a real black-hole merger by the Laser Interferometer Gravitational-wave Observatory (LIGO). A century ago, when Albert Einstein first predicted the existence of gravitational waves—subtle ripples in spacetime produced by massive objects hurtling through the cosmos—he also guessed they could not ever be seen. Although the echoes of distant celestial symphonies must ripple through the very fabric of reality, Einstein thought their ethereal harmonies were destined to remain eternally unheard. On Thursday, scientists using the Laser Interferometer Gravitational-Wave Observatory (LIGO) proved Einstein both right and wrong, announcing their detection of the first note in a cosmic symphony he predicted no one would ever hear. It was a burbling chirp of gravitational waves produced by the cataclysmic birth of a black hole from the merger of two smaller ones. Emitted in a distant galaxy when multicellular life was just beginning to populate Earth, the waves traveled at the speed of light for more than a billion years to at last wash over our planet last September, taking just seven milliseconds to traverse the distance between LIGO’s twin listening stations in Louisiana and Washington State. Now, unlike Einstein a century ago who could scarcely imagine gravitational waves ever being seen, the scientists hunting the elusive spacetime ripples already have big plans for more detectors and observatories in the near and far future. Soon, astronomers say, LIGO will record and unveil far more than the birth cries of newborn black holes. It and other operational observatories are already looking for ripples from the violent death throes of massive stars and from collisions of city-size orbs of degenerate matter called neutron stars. Current observatories could also help reveal what makes spinning neutron stars called pulsars tick, mapping their starquake-shaken interiors and any centimeters-high “mountains” (which would weigh roughly the mass of a planet because of neutron stars’ extreme density) that could pop up on their surfaces. Decades from now new generations of space telescopes could capture the mergers of supermassive black holes and glimpse pulsars spiraling to doom down their maws, or see snapping “cosmic strings,” proton-thin intergalactic defects in spacetime that may have been stretched across the infant universe during an inflationary growth spurt. Tracked and timed by radio telescopes, rapidly spinning pulsars can themselves be transformed into galaxy-spanning detectors sensitive to spacetime ripples with wavelengths measured in light-years. Ultimately, the most ambitious gravitational wave observatories astronomers can presently conceive might someday record the hiss of waves emitted in the first fractions of a trillionth of a second after the big bang. Then, cosmologists could watch—could listen—as the first seeds of cosmic structure crystallized from a seething quantum fog. The most expensive “nothing” ever made. Having found its first signal, LIGO is now gearing up to transform them into routine tools for astronomy. The twin LIGO stations each pass laser light back and forth between mirrors along perpendicular four-kilometer-long arms arranged in an L. An incoming wave would slightly warp these arms so that one became longer or shorter than the other by only a few thousandths the radius of a single proton, altering the flight time of the light and triggering a detection. Any number of background noises can scuttle the delicate measurement—LIGO can also hear ocean waves pounding distant coastlines, airplanes flying overhead and even the seismic hum from washing machines. With gravitational waves set to soon ripple through several high-precision laser interferometers on Earth, astronomers will be also be able to locate where exactly each set of the ripples is coming from. LIGO’s first detection of colliding black holes, by contrast, could only be traced to a huge arc of sky over the Southern Hemisphere. Pinpointing the sources of gravitational waves will allow astronomers to point other telescopes their way, boosting the chances of learning more about them via x-rays, gamma-rays, radio waves, neutrinos and more. The current generation of ground-based laser interferometers can only go so far, however. The length, number and location of an interferometer’s arms intimately influence its resilience against background noise and the varieties of gravitational waves it can probe. LIGO’s four-kilometer-long arms are the biggest in the world, but at the project’s Louisiana site the encroaching, noisy sprawl of nearby Baton Rouge is getting too close for comfort to the delicate detectors. Researchers are now planning and building a next generation of even bigger and more isolated detectors deep beneath the ground where hundreds of meters of overlying rock shield against most anthropogenic noises and seismic stresses. In the Kamioka mine in Japan, the Kamioka Gravitational Wave Detector (KAGRA) is already taking shape as workers construct twin sets of three-kilometer arms in newly bored tunnels. Slated to enter operation in 2018, KAGRA will use cryogenically cooled mirrors of sapphire to deliver LIGO-like sensitivity. After KAGRA, a consortium of European partners is forming tentative plans for an even more ambitious subterranean laser interferometer, the Einstein Telescope, which could come online in the late 2020s at a cost of $1 billion or $2 billion. Although it presently lacks funding and a construction site, its conceptual design calls for dual cryogenic and room-temperature beam lines running through three 10-kilometer arms arranged in the shape of an equilateral triangle rather than an L. That configuration would help it pinpoint the sources of gravitational waves on the sky and allow it to see the longer-wavelength ripples from a wider range of sources including binary white dwarfs, slower-spinning pulsars and intermediate-mass black holes weighing hundreds or thousands of suns. It would also begin to construct a reasonably detailed map of “background” sources of gravitational waves—the accumulated ripples from all the messy, violent mergers and explosions all across the sky. “People wonder why we are not content with one gravitational-wave detector, why we wish to build bigger ones,” says Harald Lück, a physicist at the Max Planck Institute for Gravitational Physics in Hannover, Germany who is a member of the GEO600 and Einstein Telescope teams. “Like electromagnetic radiation, gravitational waves cover an incredibly large range of wavelengths, and you can’t catch all of them with any single facility.” On the ground, Lück says, the arms of laser interferometers are unlikely to ever exceed 50 kilometers—past that, seismic noise, Earth’s curvature, imperfect optics and the great expense of digging deep tunnels would outweigh any conceivable scientific gains. Sooner or later, it will simply be cheaper to forsake Earth, to build and operate truly giant gravitational-wave observatories in space. Whenever the first gravitational wave mission launches into space, radio astronomers will wryly say they were there first. Using radio telescopes on the ground, researchers have already devised space-based gravitational wave detectors using nature’s resources: large numbers of pulsars spread throughout space that spin once every few milliseconds, sending out lighthouse-like beams of light that reach us in regular beats. By cross-correlating the arrival times of all the different pulses to nanosecond precision across decades, astronomers hope to detect gravitational waves with wavelengths measured in light-months and light-years as their passing periodic ripples distort spacetime around Earth. Merging galaxies should produce such extra-large waves as supermassive black holes at their galactic cores lock into orbital pairs and eventually collide. As compelling as the technique is, it has yet to deliver any detections, although the likelihood of success grows over time as astronomers incorporate more pulsars into their observations. In addition to using pulsar timing, many researchers hope to also study gravitational waves through space-based laser interferometers. Freely floating in deep space far from Earth’s noise and gravity, such facilities could in theory boast arms of almost any length. In practice, however, designers of possible future missions have grappled with the great complexity of engineering such ambitious spacecraft as well as new frontiers of contaminating noise in space. Those limitations have constrained their designs to arm lengths of “only” millions of kilometers. In the 2000s NASA and the European Space Agency jointly worked to develop a Laser Interferometer Space Antenna (LISA), a constellation of three satellites that would form a triangular interferometer with three five-million-kilometer arms. That would be big enough to see gravitational waves emitted by any merging supermassive black holes that may have existed around the time when the universe’s first stars began to shine, about a hundred million years after the big bang. In 2011, however, NASA abandoned the effort due to its high estimated cost and shortfalls in the agency’s science funding. ESA regrouped and downsized the project to become “eLISA,” an “evolved” design calling for three satellites forming one-million-kilometer arms that could lift off in the mid-2030s. Last December ESA launched eLISA’s precursor, a technology development mission called LISA Pathfinder. Meanwhile, other researchers are attempting to develop an alternate space-based interferometry technology that uses microscopic clouds of atoms rather than bulky spacecraft to further shrink the need for long, expensive baselines. Currently under commissioning in an orbit some 1.5 million kilometers sunward of Earth, LISA Pathfinder is set to begin science operations in March, although it will not be capable of seeking gravitational waves. Instead, it will demonstrate that its payload of two gold-platinum cubes can come as close as possible to a state of weightless, perfect rest. Held in a shielded vacuum enclosure within the spacecraft, the cubes should feel essentially no outside forces other than gravity. If separated by millions of kilometers and linked by lasers, such a system could then detect the exquisitely small distance changes caused by passing gravitational waves. Reaching a state of perfect rest within a sunlight-baked spacecraft studded with heaters, antennas, and thrusters is far from easy, however. “Think of the weight of a bacterium sitting on your hand—that’s roughly the same amount of residual acceleration, of force, that a cube [is allowed to] deviate from freefall” on the spacecraft, McNamara says. Lasers on LISA Pathfinder measure a cube’s distance from the enclosure’s walls, directing microthrusters that keep the spacecraft centered on the cube. The microthrusters are so minuscule that a thousand firing at full blast could barely lift a sheet of notebook paper in Earth’s gravity—yet the 450-kilogram LISA Pathfinder only carries six. In 2005, before it abandoned LISA, NASA conducted a small study investigating a possible super-sized successor comprising a complex arrangement of four LISA-like constellations with beefier lasers and telescopes. Called the “Big Bang Observer,” the mission as conceived would probably be so astonishingly expensive that few if any researchers have dared to actually estimate its price tag. 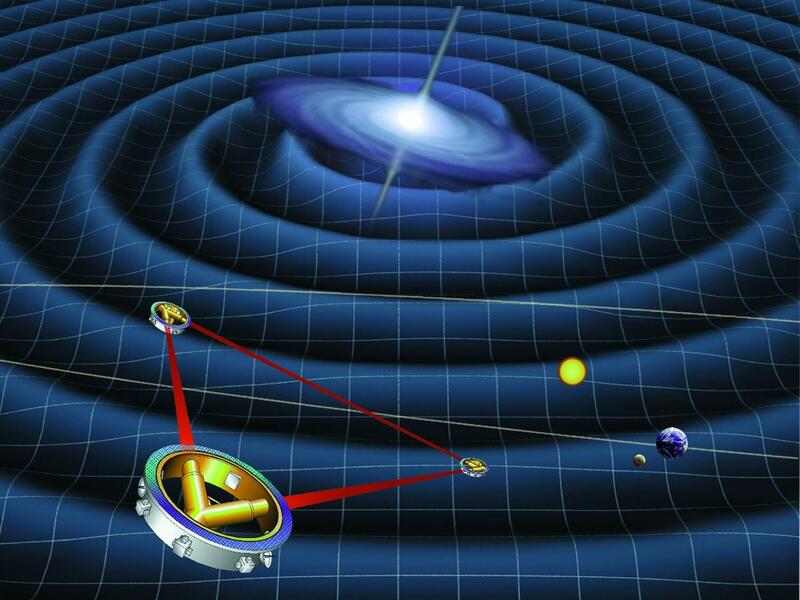 It would be sensitive to nearly all the same targets investigated by LIGO and LISA out to distances of 10 billion light-years or more, but its true goal would be to assemble a detailed map of gravitational waves from the earliest eras of the primordial universe. This “stochastic gravitational wave background” would contain crucial information about the universe’s very first moments and its mysterious era of inflation, when it seems to have almost instantaneously ballooned from proton- to grapefruit-sized, amplifying quantum-scale density fluctuations along the way that shaped the first large-scale cosmic structures. In its importance for our understanding of—well, everything—measuring such a signal would be even more revolutionary than mapping the cosmic microwave background (CMB), the relic light from when the early universe first cooled to transparency some 380,000 years after the big bang. The CMB is a literal firewall on efforts to peer further back in time using light—nearly all information about earlier events carried by photons was erased as they bounced aimlessly within the hot, dense plasma that suffused the infant universe. Yet for primordial gravitational waves, the CMB is not a firewall—it is a window. Those with very long wavelengths could leave faint imprints in the CMB to mark their passing. Most primordial waves would breeze through without a trace, however, scarcely interacting with anything else in the universe for all the rest of time—at least until they ripple through the right detector. “In a way, the stochastic background is the hardest thing to detect, but also the one which would offer you the most insight, because black holes and neutron stars are kind of old hat,” says Bruce Allen, a LIGO team member and director of the Max Planck Institute for Gravitational Physics. “Let’s suppose we jump ahead a thousand years to when our highly advanced civilization has built observatories that cover the whole gravitational spectrum.” Such tools could map the spectrum of primordial gravitational waves and perhaps distinguish “kinks and bumps” within it that reveal the earliest and most epochal milestones in the universe’s evolution.